Bushra A., a sophomore, is a responsible, respectful and relentlessly kind member of the Newcomer Center student body. Once a quiet, introspective young lady, she has now opened up and become a real go-getter. Bushra is a sponge, absorbing everything and continually seeking clarification of all things academic while thinking deeply about issues and questions. Bushra has also demonstrated an abiding concern for other students who struggle, taking the initiative to work one-on-one with them to ensure they catch up and succeed. 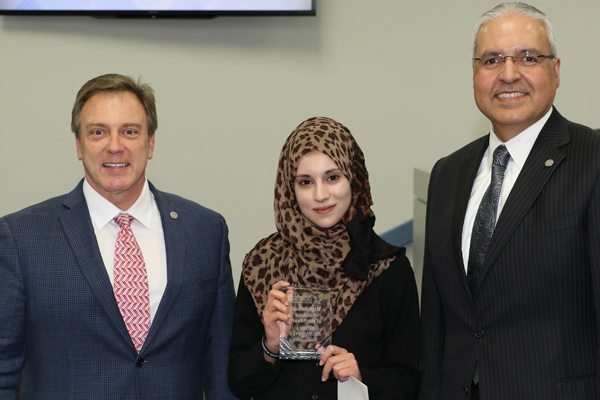 Bushra is a rare student who expresses appreciation for the time and effort her teachers put into teaching. She has a genuine thirst for knowledge, and she will continue to have a successful academic career in the AISD. Congratulations, Bushra! Previous Congratulations Area 7 and Area 8 Spelling Bee winners!